Stromtrooper Forum : Suzuki V-Strom Motorcycle Forums > Popular Forums > DL1000A - 2014-2016 > 2014+ DL1000A Speedometer Correction Success! Great news! 12-O'Clock labs now makes a $23 adapter for their S1 model which fits most Suzuki's prior to traction control. It plugs into the back of the speedo gauge itself. There's only one plug back there so you can't miss it. So you buy the S1 model and the adapter and that's it! Fortunately for me I removed my S1 from my 650 that I just traded. I am posting this on two threads on the subject that I have been following. Hope that's ok. I ordered one to see if it works. I always said if someone came out with a plug n play one I would buy it, not wanting to cut into wires if I can avoid it. Last edited by Bugzy; 04-13-2018 at 05:43 PM. "Great news! 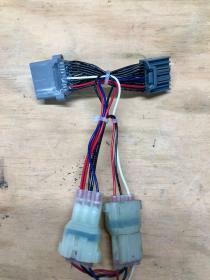 12-O'Clock labs now makes a $23 adapter for their S1 model which fits most Suzuki's prior to traction control"
Well...the '14+ Vstrom1000 does have traction control. So you're saying this 12-O'Clock Labs adapter works on the '14? Yes, it does. Maybe I worded it badly. I meant that they had a model, the S1, that was plug and play BEFORE traction control was put on the bikes. After TC was added, our only option was the U1 universals model and doing all the wiring. Now there is an adapter that for the S1 model that is plug an play on the 2014+ bikes. I hope that came through, lol! 2016 Suzuki GSX-S1000F, aka "The Scary Beast"
Sure thing, Sorry if I worded it badly though. But you need the S1 SpeedoDRD *AND* the adapter. Fortunately I had the S1 I took off my 650. Hey guys, here's a picture of the Adapter I got from 12oclock Labs with my S1 Speedo DRD plugged into it. The adapter plugs into the back of your instrument cluster. I'm posting a link because for some reason I can't figure out how to add a normal size picture to a message here. It says it has to be no bigger than 620x280 which is really tiny. Last edited by Ron Strommer; 04-21-2018 at 03:13 PM. Ok, I think I got the picture thing figured out. Here's the adapter. I had it plugged into the back of the speedo in ten minutes. Works great. Scorch and Toshbar like this. Excellent. Mine is still in transit. Where did you mount the S1, is the cord long enough to have it accessible someplace? With the adapter attached, yes the cord is plenty long. I snaked it out from behind the right side of the instrument panel and then behind a wire bundle that runs very close to the inside of the right side of the fairing. I was able to easily reach it when I stopped to make adjustments and then tuck it back in there. FYI, I started off with a -7.5% reduction, then I went to 7.0, 6.5 and finally hit dead nuts accuracy with -6.2%. Boom! So you may want to start at 6.2% and go from there. The odometer is reading about 2.5% low but who cares. Cool. I will try your setting first, are you using stock sprockets? It will be good to have the ODO slightly below since I assume it was too high before.